For the tofu: Drain any liquid from the tofu. Pat dry with a paper towel. Slice the tofu into 1/2-inch thick pieces. In a large pan, heat about 2 tablespoons of oil; pan-fry the tofu slices until slightly golden. Don't overcook the pieces or they'll start to get hard. The tofu should still be moist. Transfer the tofu to a plate. Once the tofu is cool enough to handle, cut the pieces into very thin strips. Set aside. For the bean thread noodles: Place the whole package of dried bean thread noodles in a bowl. Don't forget to cut the little threads and discard them! Soak the noodles in cold water for 30-40 minutes and drain. Chop into 1 inch threads. Set aside. For the green lentils: Place the lentils in a small saucepan, barely cover with water and slowly cook for about 30 minutes. It will form a dry paste. Set aside. For the black mushrooms: Soak the black fungus mushrooms in boiling water for 2-3 minutes then drain. Chop finely. Set aside. For the filling: In a saucepan, heat 2 teaspoons of canola oil. Add the garlic and 1 finely minced shallot. Cook until slightly golden. Transfer to a bowl (don't drain). Let cool. In a large bowl, combine the shredded carrots, soaked bean thread noodles, lentils, fungus mushrooms, ginger, lemongrass (if used), tofu and cilantro. Mix well. Add the golden garlic and shallot with oil, raw shallot and onion. Sprinkle with mushroom seasoning salt and sugar. Mix well. Refrigerate the mixture until you're ready to wrap. Check seasoning: In a small pan, heat about 1 teaspoon of peanut oil. Add about 1 tablespoon of the tofu mixture. Cook for about 2-3 minutes. Taste the filling. Adjust seasoning if necessary. Season with more salt and pepper if necessary. Place a betel leaf, vein side up, and spoon about 1 tablespoon of the tofu filling at the base of the leaf. Form a log with the filling and roll the wrapper once towards the top corner of the leaf. 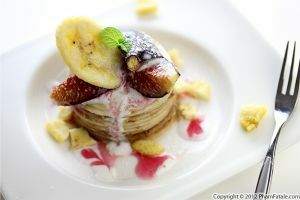 You want to make sure not to over-fill the leaf; otherwise the excess filling will burst out of the sides while cooking. Using kitchen shears, snip the excess ends of the leaf. Secure a toothpick into the Vietnamese "dolmades" (see tips). Repeat until all the ingredients are used. Brush a grill pan with the remaining oil. Place the tofu stuffed betel leaves on the grill pan. Sear them for about 2-3 minutes per side. Remove and discard the toothpicks. 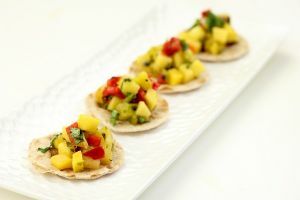 Serve immediately; you can serve them as appetizers or a main course. 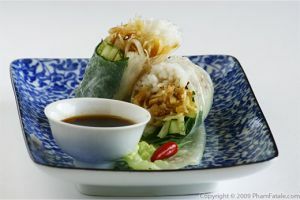 You can garnish with Vietnamese mint, Thai basil, chopped green onions, pickled baby shallots, pickled carrots and Chinese cabbage, bún (rice vermicelli noodles) or/and crushed roasted peanuts and nước chấm (Vietnamese vegetarian mock fish sauce) on the side. When making tofu filling, it's important to add a binding element. 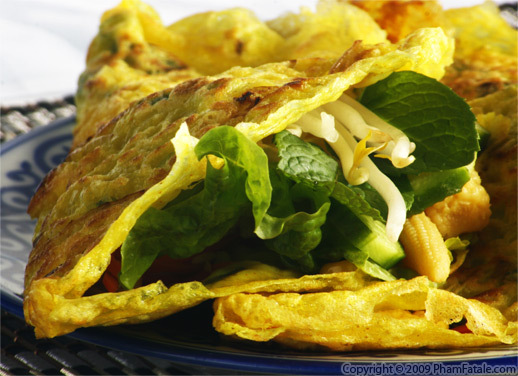 Since egg yolks are not the right ingredients for vegetarian diet, mung beans, taro root or potatoes are the key to the filling. 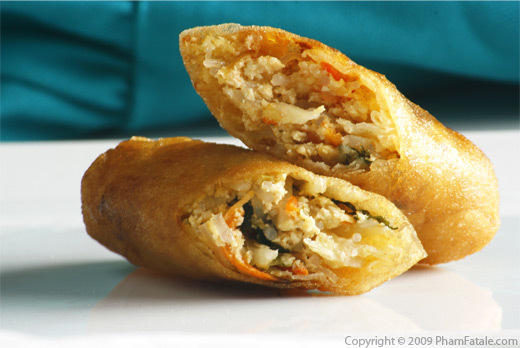 For this recipe, mung beans, also called green lentils (đậu xanh in Vietnamese) give the filling a sticky consistency. Green lentils (đậu xanh in Vietnamese). After several tests, Thanh Son tàu hũ (tofu) is hands down the best kind to use for this recipe. If you live in the Bay Area, you have to try it. They sell in almost all the Asian markets in downtown San Jose and their main shop is on 2857 Senter Road, San Jose. It's a very little shop but everything is very good. Their tofu has the best texture; they make it fresh daily. This is the perfect place for vegetarians. I always get 2 to 3 pieces of fresh tofu every week. If you don't have this brand, you can use any other firm tofu. Wild betel leaves can be found at most Indian and Asian stores, or you can also buy them online. Dried woodear mushrooms, also called black mushrooms or fungus mushrooms (nấm mèo in Vietnamese), can be found in any Asian markets. Lemongrass is quite expensive in stores and it sold by bulk in bunches of 5 stalks. It's a perennial. I asked Lulu about it and he started to grow 4 "bushes" last year and we keep getting some, which is very convenient. The lemongrass stalk has to be finely chopped, then ground in a mini food processor. To ensure that all the lemongrass turns into a fine moist powder, I pound the finely-chopped lemongrass in a mortar and pestle with about 3 tablespoons of water. Check out other recipes using lemongrass. You can find small packages of dried bean thread noodles in any Asian stores. I buy the Ba Co Gai (Three Ladies) brand. 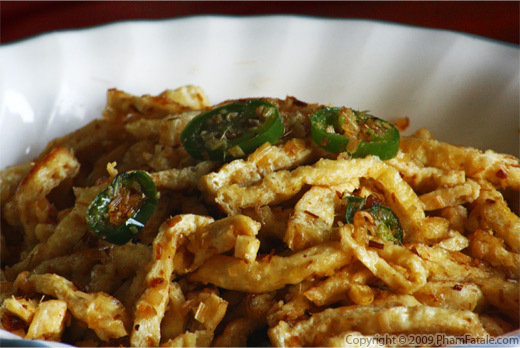 I've received a question from "Zeitgeist", asking why her bean thread noodles turned out so dry when making bì chay. I've tested out several other brands and found out the soaking time varies depending on the brands. My suggestion is to either soak the bean thread noodles longer or microwave (or steam) the filling for a few seconds until soft (20 seconds) if they're too dry. I insert a toothpick into each stuffed leaf to make it simpler to flip while cooking, but you can also use a long wooden or bamboo skewer. Just make sure you pre-soak them in water to prevent them from burning while cooking. A good way to check if your filling is properly seasoned is to sauté some in a frying pan with a little oil. If it's not quite seasoned, add more salt and pepper as needed to the mixture. Once the betel leaves are wrapped up, it's too late! One of the most common condiments to serve with Tàu hũ cuốn lá lốt (betel leaf wrapped tofu) is pickled baby shallots. 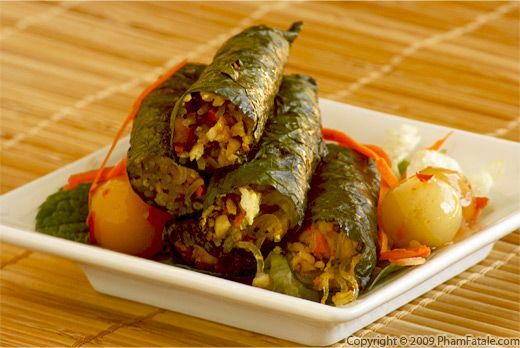 To make a meat version "bò lá lốt" (vegetarian betel wrapped beef), just replace the green lentils and tofu with 2 parts beef and 1 part chicken for a total of about 1 pound of ground meat. Season the meat and marinate overnight. 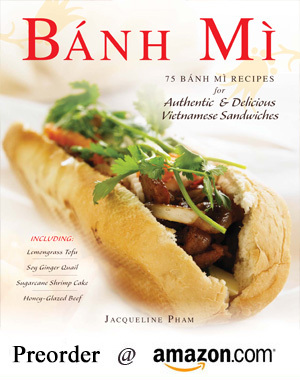 Published By: Jacqueline Pham on December 5, 2009. These look very good and your instructions are clear and thorough. I love thịt bò nướng lá lốt and look forward to trying these. You make these look easy! They certainly look super tasty! Another winner, and I am so intrigued by using betel leaves in this manner. You are such an inspiration for trying ingredients in ways I had not thought of.